God’s promise to uphold and protect His Word is a precious and reassuring promise. To observe how God has accomplished this throughout the ages is edifying and faith strengthening. 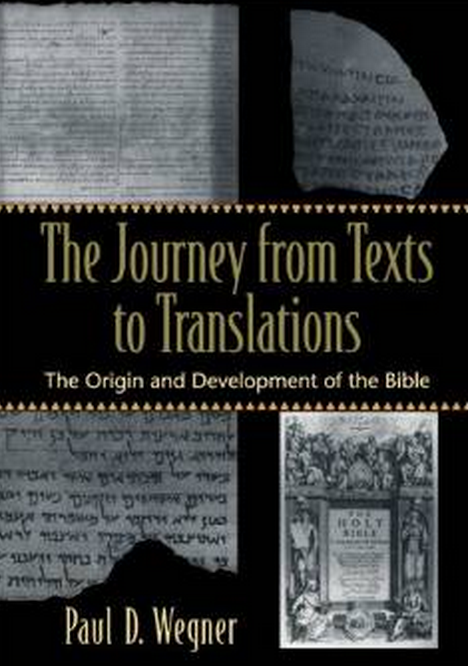 The Journey from Texts to Translations by Paul D. Wegner is a meticulously researched and richly illustrated treatment of the Bible’s transmission and translation, from ancient manuscripts to popular English Bibles, showing us the practical means by which God has sovereignly guided the development of Scripture. After covering some preliminary matters regarding the Bible—it’s nature, it’s purpose, and some brief introductions into each section of the Bible—Wegner begins the journey at the ground level, with a discussion of the earliest forms of writing and their subsequent development. After some investigation into the history of language, Wegner arrives at the Hebrew, Aramaic, and Greek dialect and examines some important factors regarding the languages of the Old and New Testaments. Wegner continues the journey with a lengthly discussion of canonicity, covering such topics as the Old Testament canon, the New Testament canon, the apocrypha and the pseudepigrapha. In this section we learn how both the Old Testament and New Testament canons were formed and what factors determined why certain books were placed into the canon and why other books were left out. Textual criticism is treated at length as well, as Wegner examines a host of sources for both Old Testament and New Testament, demonstrating the manifold manuscripts and textual witnesses that provide abundant evidence for the both testaments. Despite the fact that we do not possess the original manuscripts, we are able to construct, by the existing copies we do posses, an extremely accurate text for all the Scripture. God has protected His Word! From here we are taken to the history of the English Bible. We are introduced great men like Wycliffe and Tyndale, and provided the opportunity to trace the legacy of the English Bible from its beginnings in 14th century England, to its prominence in modern day America. Some noteworthy English translations that are examined are the King James Version, New King James Version, American Standard Version, the Living Bible and the Message. Each translation is studied in terms of its historical development, specific qualities, translation approach and concluded with brief critique. On the whole, this is an edifying and informative read. It is just over 400 pages, and is thick with charts, pictures, mini-biographies and a host of other helpful materials. It will benefit any student of the Bible who desires to better understand the history of the Bible, whether they read it from cover to cover, or only use it as a reference. Yo D, Thanks for this review! We’ve been studying about the Bible and transmission and translation is coming up. This sounds like a great resource! I’m glad you enjoyed the review! Sounds like it came just at the right time!